Ryan studied Exercise Physiology at James Cook University in Townsville. He worked in the JCU anatomy lab as a tutor, technician and associate lecturer collectively for 7 years. 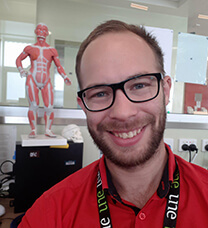 He completed his honours in “blended learning for anatomy education” in 2015 and now manages the UNE anatomy laboratory and body donor program. Ryan coordinates ANAT120: Functional Musculoskeletal Anatomy in T2 and teaches anatomy content into ANAT110, MEDI1101A and MEDI2101A. Ryan is currently seconded to Lecturer in Rural Medicine until August 2019.